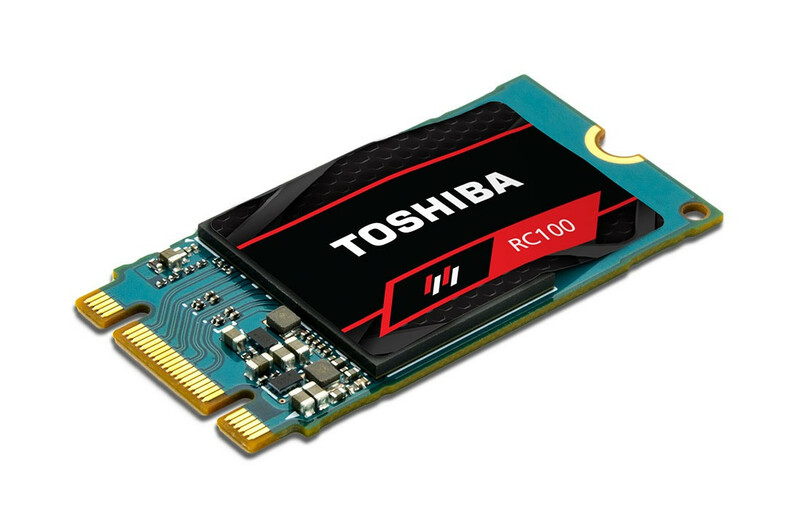 At CES 2018, Toshiba showed off a new RC100 Series of M.2 NVMe SSDs along with their 96-layer QLC NAND technology. The RC100 SSDs enable mainstream PC users to upgrade to SSDs in a cost-effective and power-optimized manner. 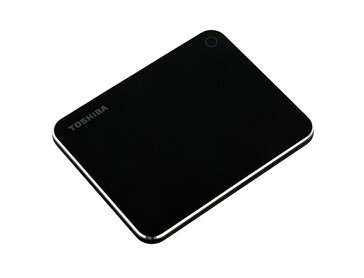 Toshiba Memory America (TMA) showed off a couple of storage technologies at this year's CES. The first of those is the RC100 — an SSD that sits right between high-end SATA SSDs and top-tier NVMe SSDs, enabling mainstream adoption of the M.2 NVMe standard. The other announcement is a more futuristic flash storage based on a 96-layer quad-level cell (QLC) BiCS 3D NAND. The RC100 has the potential to bring NVMe technology to the masses and is designed with performance and affordability in mind. It will utilize Toshiba's 64-layer BiCS (Bit Cost Scalable) 3D Flash memory in a 2242 M.2 form factor. BiCS flash memory implements a vertically stacked three-dimensional (3D) flash memory, which leads to higher die density compared to 2D NAND flash. Toshiba also showcased the industry's first 96-layer 512 GB QLC BiCS 3D NAND. The QLC is advancement over the triple-level cell (TLC) 3D NAND that is used these days and allows for more storage capacity in the same die area. Toshiba first revealed plans for showcasing the 96-layer QLC NAND back in June 2017 with production samples to be ready by 2018. It is not known whether the increased storage due to the denser packaging would come with a performance penalty. Also being announced is the XS700, which is an external SSD that incorporates BiCS flash technology. Pricing and availability information for the RC100 and XS700 are not yet known. LAS VEGAS--(BUSINESS WIRE)--This week at International CES 2018, Toshiba Memory America, Inc. (TMA), the U.S.-based subsidiary of Toshiba Memory Corporation, will be highlighting the use of its industry-leading BiCS FLASH™ 3D memory in several applications – including its new lineup of NVMe SSDs, the RC100 Series. At CES, TMA is collaborating with its customers and technology partners to take on the future – together. Toshiba was the first company in the world to announce 3D flash memory technology, which effectively addresses the processing, storage and management of the growing volume of data generated worldwide. Recent announcements see the company continuing to lead the industry forward, including the introduction of a 96-layer 512Gb die; the debut of the industry’s first flash memory device with quadruple-level cell (QLC) technology; and the addition of Through Silicon Via (TSV) technology. Already enabling the enterprise, data center, PC and mobile applications of today, TMA’s BiCS FLASH has paved the way for the applications of tomorrow. In everything from artificial intelligence and virtual reality to a growing number of automotive applications (such as infotainment), high performance computing and the ever-expanding “internet of things,” storage density needs will climb higher and higher – and BiCS FLASH was designed with this in mind. CES – the biggest stage for consumer technology breakthroughs – is the ideal forum for the inventor of NAND flash to introduce its latest innovations. Harnessing the power of its state-of-the-art 64-layer BiCS FLASH 3D memory, TMA’s latest SSD innovation sits right in the sweet spot between SATA SSDs and higher-end NVMe SSDs. The new RC100 Series was designed to address the entire spectrum of computing – and make the benefits of NVMe accessible to the mainstream market. Making its debut at CES, TMA’s RC100 M.2 NVMe SSD Series has been built from the ground up to deliver faster-than-SATA performance in a cost-effective and power-optimized solution for today’s DIY builders and PC gamers. A small 22x42mm form factor, low power consumption, excellent performance and an affordable price all give the RC100 a true competitive edge. Also at CES, the TMA Storage Group will demonstrate its small, sleek, ruggedized external SSD. The new XS700 incorporates Toshiba’s BiCS FLASH technology and was designed with portability and affordability in mind. TMA will conduct demos and host customer and partner meetings at its private suites at the Westgate Las Vegas. The company will showcase new products at Pepcom’s Digital Experience at CES from 7-10 p.m. on Monday, January 8. As of June 28, 2017. Toshiba survey. ©2018 Toshiba Memory America, Inc. All rights reserved. Information in this press release, including product pricing and specifications, content of services, and contact information is current and believed to be accurate on the date of the announcement, but is subject to change without prior notice. Technical and application information contained here is subject to the most recent applicable Toshiba Memory Corporation product specifications.